In 2017 my husband, Clay, and I traveled to Ladakh, India to trek, climb mountains and experience the unique Ladkhi culture. 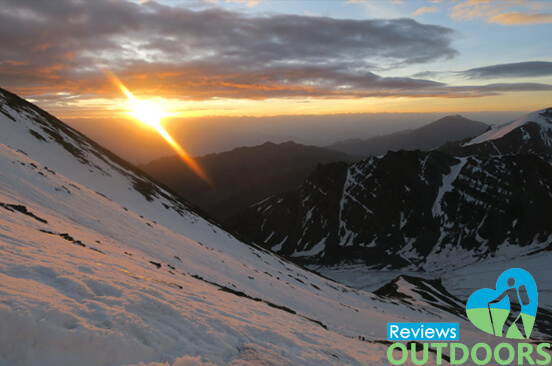 Though we spent the majority of our six-week trip trekking, our climb up Stok Kangri proved to be the most physically challenging experience of my life. Incidentally, it is also the best backpacking adventure I’ve ever had. 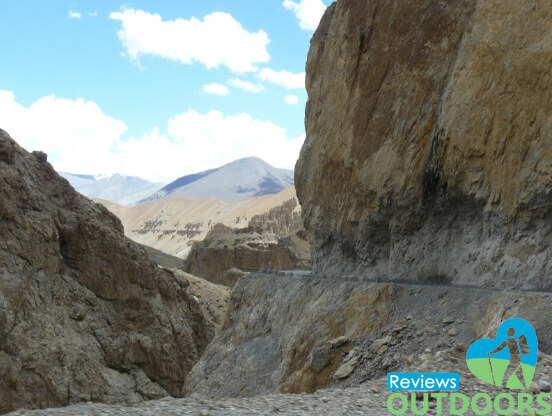 But before the actual adventure, I should share a little about Ladakh and our time preparing for our adventure. 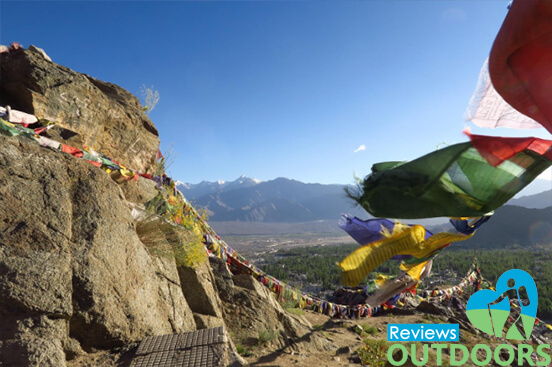 Ladakh is located in Northwest India, nestled in the Himalayas between Pakistan and Tibet. Actually, part of Ladakh is across the Chinese border, and wandering yaks and goats frequently make themselves illegal migrants. Though Ladakh has its own unique culture, it bears many similarities to Tibet. While there is a large Muslim presence, Buddhism has played a huge role in the landscape and culture. Ladakh falls in the Himalayan rain shadow, making it a semi-arid desert. With nearly the whole regions sitting above 3000 m, the climate is harsh enough to stop most trees from growing, making for a brown, rocky landscape. 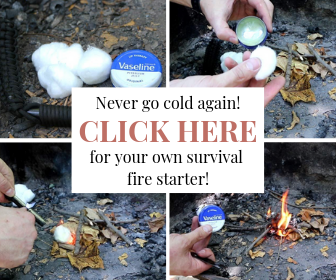 Summers can be blistering hot, and winters frigidly cold. Visting Ladakh does not require any special Visa, other than the Indian visa. Though you do require an inner line permit for many of the areas outside of Leh, the biggest town in Ladakh. These are a few dollars a day and can be arranged at guest houses or tour operators. Getting to Ladakh was an adventure in itself. We flew into Delhi, and after a few days, boarded an overnight bus to Manali a tourist town in the Himalayas 500 km north of Delhi. Back in Canada, we arranged to take a taxi for the two-day drive to Leh (Ladakh’s largest town) over some of the world’s highest and most treacherous roads. This wasn’t the cheapest option for getting to Ladakh. Catching a bus or sharing a jeep can save a lot of money. Even flying is cheaper; a one-way flight from Delhi is about 5000 -10 000 INR ($70-$140 USD) per person, while we paid around 12 000 INR (around $170 USD) each to get to their overland. The drive was beautiful – well, at least if you consider narrow, bumpy roads carved into the sides of cliffs beautiful. It was definitely more interesting than a plane ride and wouldn’t have traded the experience. Do note, however, that the road is only open from late May to mid-September. While the drive was amazing, I made the unfortunate discovery that high altitude affects stomach flora, and I arrived in Leh with a combo pack of altitude sickness and a stomach bug. Leh was over 3000 m, so it was hard to find respite. I ended up taking Diamox to help with acclimatization. Of course, the Diamox didn’t help the stomach issue, and it took me a whole five days to figure out that I needed antibiotics too. It wasn’t a pleasant week. The guest house owner assured us that most people get sick coming over the road. From Leh, we could see Stok Kangri looking down on us and all the mountains around it. At 6121 m, it’s 29 m taller than Denali, North America’s highest peak. 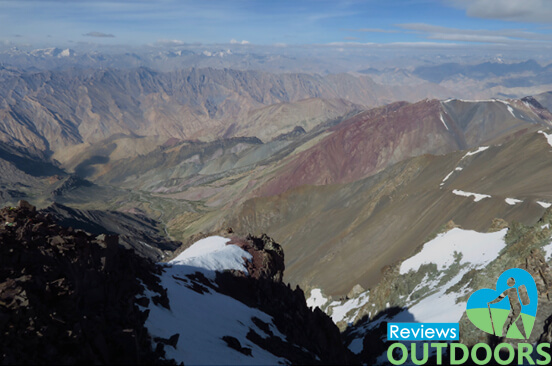 Unlike Denali, however, Stok Kangri is easy to access and requires little mountaineering skills. While the idea of a crowded mountain peak turned us off a little, it was always there, calling to us. We spent the next few days exploring the region, visiting ancient palaces and monasteries, riding camels, and soaking in the atmosphere. 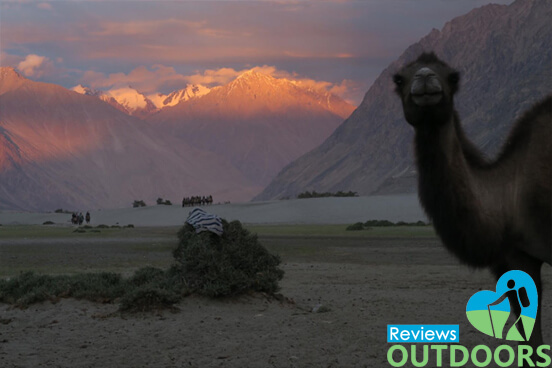 We arrived in Ladakh with a number of treks in mind but hadn’t officially planned or booked anything. So we started off our best backpacking adventure yet with an acclimatization hike of Markha Valley. 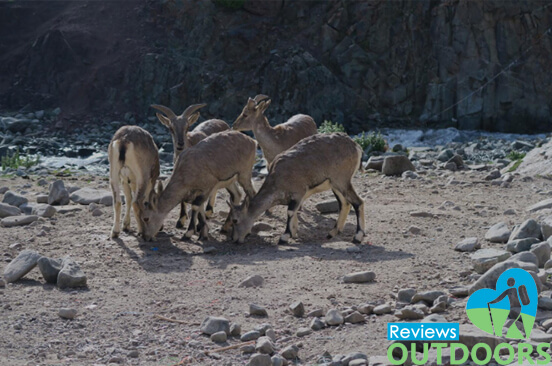 It’s a very popular hike that crosses a number of 5000+ m passes. The day before we started the trek, a man passed away from altitude sickness on one of the passes. It was a sobering reminder of the dangers of high altitude trekking, and the importance of acclimatization. As we got higher up the valley, we could feel ourselves slowing down. By the time we were at 5000 m, even talking had us out of breath. Then it was off to Mentok Kangri. For this one, we decided that we needed a guide, and with him came a cook, pony man, and ponies. It was quite the entourage. 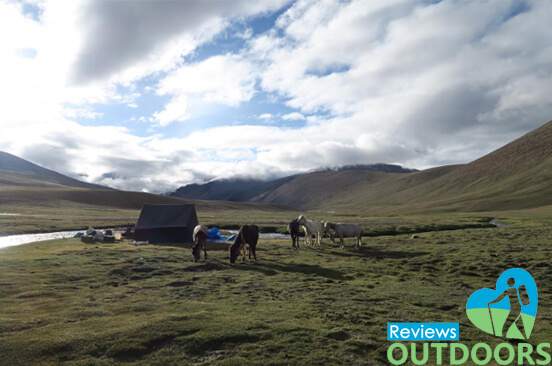 We completed a ten-day trek from Rhumste to Tso Moriri, culminating in climbing Mentok Kangri (6250m). The trip was incredible, crossing the desolate Changtang Plateau and meeting some of the Nomadic Changpa people. While it was lovely to have biscuits and tea waiting for us at the end of a long day of walking, we missed the independence that comes with trekking alone, and we decided to do our last climb, Stok Kangri, without a guide. The logistics for climbing Stok Kangri were fairly simple. Although it certainly took some running around and asking questions to get ready. Before we left, we bought permits for 2000 INR each, though we could have bought these at base camp. 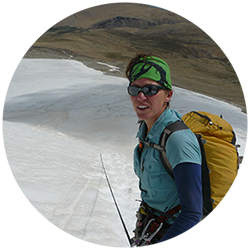 Guides, mountaineering gear, tents, hot meals, and bedding are all available. We rented rope, harness, crampons, and ice axes from base camp for around 1500 INR each. Another 1500 INR each per night got us three hot meals and a tent. A guide would have cost another 8000 INR. We followed the recommendations of others and brought our own sleeping bags but in hindsight, we should have brought our sleeping pads, as the pads up there didn’t provide much warmth or comfort. We thought we’d brought enough warm clothes from Canada, but after a chilly climb on Mentok, we stocked up on some extra warm clothes in Leh. The temperatures hit around -10°c at the tops of both peaks, and the thin air made it extra hard to stay warm. It took two days to get to base camp from the village of Stok (and easy taxi trip from Leh). Though the hike can be done in one day, the stop is important for acclimatization. We reached Stok Kangri base camp around noon on day two, and after having lunch of chow mein, headed up a nearby ridge for even more acclimatization. Dinner was served in a crowded mess tent, and it was complete with soup, pasta, dahl, rice, vegetable curry, and egg curry. Not bad for a tent at 5000 m! It was a good thing too because we needed to stock up on calories. We were planning for a 12:15 AM departure so we could capitalize on a frozen glacier and snow slope. That night, we didn’t so much as sleep, as dozed. While we also had a midnight departure on Mentok, we felt much more uneasy this time. The sleeping mats didn’t do much to insulate us from the ground. So we curled up, listening to the gusts of wind trying to sweep the tent away, and waiting impatiently for our alarms. As it was time to get up, we were groggy, cold, and tired. We left later than most of the other five parties so we could follow the tracks of the people ahead across the glacier. We figured that we’d be able to catch up and still at least be on the ridge by dawn. Arrogance is not becoming of anyone, and we lagged further and further behind. I started to struggle with breathing almost immediately. On several occasions, I turned around in alarm after hearing strange wheezing behind me, only to realize that it was me. By the time we reached the glacier, we were the very last party, but we roped up and pressed on across the glacier. From the glacier, we could see the headlamps of the parties in front of us slowly making their way up into the darkness. We followed suit and made our way slowly up a steep, snowy, south face. Despite the headlamps ahead, the dull outline of looming mountains reminded us of where we were and the task we had ahead of us. That, combined with the knowledge that we were still in the earliest and easiest stage of our climb made me feel alone, uneasy, and yes, a little scared. There was something else though – the excitement of the unknown, perhaps. Whatever it was, it kept me going. Oddly, as the slope got steeper and the air got thinner, I felt more energized. We even passed one of the parties. By 4:00 AM the blackness looming over our heads started to turn ever so slightly grey. The ridge mocked us from above, and while it didn’t look far, we also knew by then that things always take far more energy at altitude. We slogged on. As the sun slipped up over the eastern horizon, we couldn’t help but feel a renewed surge of energy. Of course, a surge of energy at 5700 m looks a lot like more slogging. When we finally gained the ridge, the views were stunning. As a person who grew up near mountains, I confess to taking them for granted. But the mountains of Ladakh were nothing like the mountains of Canada. Ladakh is brown and dry, and unforgiving, and as we looked around at the brown mountains capped with ice, we were amazed and humbled to be in the midst of this harsh landscape. Of course, our adventure was not over. We had a ridge to walk, and it was no leisurely stroll. It would have been a light scramble at home, but (as I continue to assert), everything is harder at high altitude. By this time we were operating on less than half the oxygen, we’d get at sea level. In our exhaustion, we were becoming clumsy and a misstep could have meant a deadly tumble into the Himalayan abyss. We made it to the summit at around 10:00 AM. Our fears of a crowded mountain were unfounded and we found ourselves alone on the summit. We speculated on whether a large mountain far to the northwest was K2, which, at 8611 m, is the world’s second highest mountain. I found myself speechless, though not out of awe. My wheezing had taken its toll on my larynx. The hike down was considerably faster and we stumbled into camp at around noon. We had planned to stay there for the night, but I was concerned about my wheezing, and neither of us was interested in another cold, sleepless night. After a good rest and a lunch of fried rice in the mess tent, we packed our things and made the long trek down to Stok Village. We stumbled into Stok around 6:30 PM, making for a total of 16 hours of hiking. When I think of my trip to Stop Kangri, the first thing I think of isn’t actually the views or the sense of accomplishment. But the indescribable feeling of being two tiny dots, alone, in the dark, in the largest mountain range in the world. 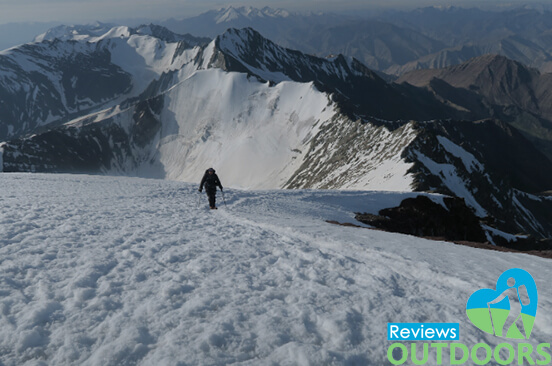 I can’t say that I recommend that others climb Stok Kangri without a guide, or even at all. It requires acclimatization and at least basic mountaineering skills. Even with a guide, I would only recommend it to a confident mountain hiker who is well acclimatized. Here is a more detailed map of my journey from Delhi to Stok Kangri. The Markha Valley is still challenging and winds its way through a stunning valley. It has the benefit of homestays along the way to house and feed trekkers. Regardless of the Ladakhi adventure, trekkers can always save money by hooking up with another group. Also, they will sometimes be offered deals if the trip needs more people in order to run. 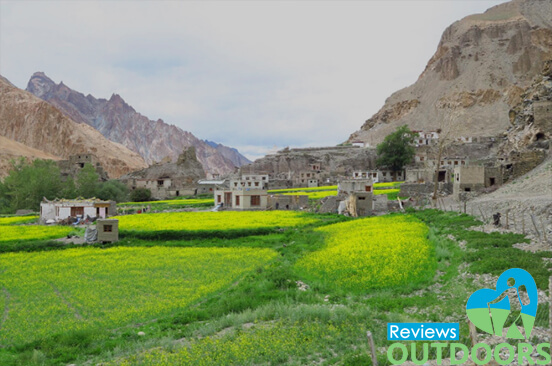 If you are also thinking of planning a trip to Ladakh and having the best backpacking adventure of your life, and have a bit of flexibility, I definitely recommend holding off on booking anything until you get to Leh.